Enjoy a clean, stress-free and organize working environment without having supplies scattered all over the place. The C-Line storage box contains three separate compartments, allowing flexibility when it comes to organizing each individual section. The large bottom compartment is perfect area for office and school supplies like pens, pencil and rulers. On the top of the lid, it contains two separate compartments which can easily store erasers, paper clips or any smaller items. 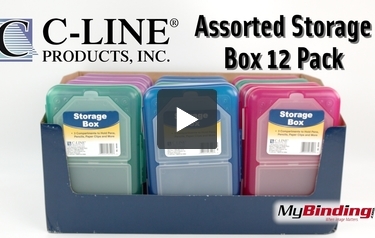 C-Line product line offers a selection of specialty holders and boxes to keep everything from a desk to a warehouse organized and efficient.